Do you see what happens? Do you see what happens when you give negative reviews to local bands? Good thing for Torontontontoist, there’s no need for a negative review or much backlash in the case of Annex-favourites the Diableros. 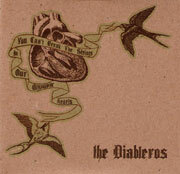 It all starts when opening track “Working Out Words” betrays the commonplace misconception that the Diableros will play some sort of psycho-billy or Mexicana pop (Diablero = Spanish for evil sorcerer, you know). Its’ burried/blurried vocals and unconvential-as-conventional pop hooks alone are enough to make the Diablero debut stand out – and in most respects, it does. The Diabs’ first track is exactly what it should be: a fantanstically catchy opener welcoming further listening. The album continues down this path – not exactly mapping out new territory but certainly not sticking to the old routes – until a very strong closer makes the album completely worth the $8 or whatever it costs. “Golden Gates” is a very cute mini-tour-de-force, and acheives the closure that eludes most debut albums. If comparisons had to be made, perhaps Pixies-Strokes-National-Arcade Fire-Wolf Parade-Jully Black-Constantines? If comparisons do not have to be made, this is a very tight debut.